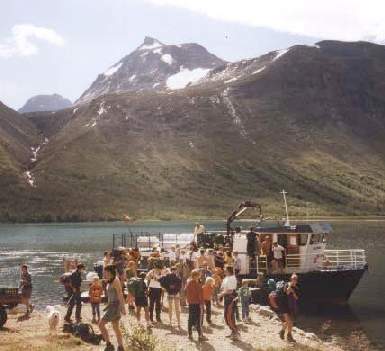 Backpacking in the Jotunheim National Park, Norway, 1997 - Day 7: By boat and foot to Langedalen. Previous: Day 6: Sun and Rest. 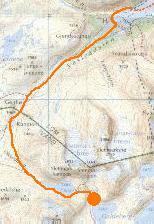 Index Next: Day 8: Torfinns egga and Kvitskartind. 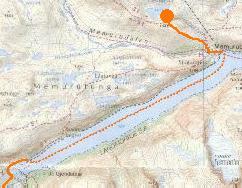 Day 7: By boat and foot to Langedalen. Having climbed the two highest peaks in this part of the Park I decided to move on to get some variety and chose the area between Gjende and Bygdin - including the familiar-sounding Langedalen valley. As I walked down from my campsite to the mountain lodge at Memurubu I passed a lot of people on their way up towards Surtningssua - far more than I had seen on the summit a couple of days previously. Since the weather was much the same I could only conclude that most of those who set out don't make it to the top! From Memurubu I boarded a boat for a 10km trip along Gjende to Gjendebu, and from there walked up Vesleådalen and Oksedalen. North East facing Oskedalstjernet was surprisingly icy, and the snow-covered path alongside it seemed rather precarious, but I survived and made camp a little later near the warmer Galdebergtjerna. Disembarking at Gjendebu, Mesmogtind and Svartdalspiggane behind. Total for the day:15km, 700m.